All transactions are safe and secure with a reliable history in online purchasing behind each of our associates. 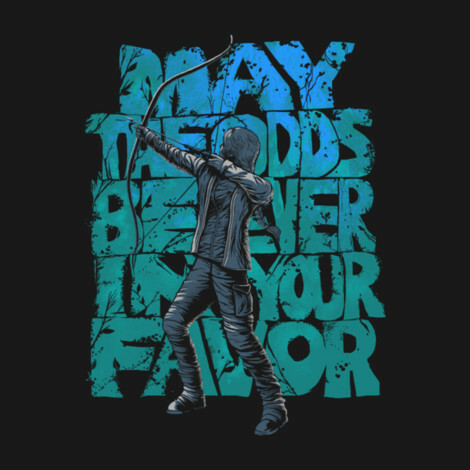 Buy the Odds in Your Favor t-shirt to own Hunger Games clothing and merchandise. Not only does this propaganda design by the artist CrumblinCookie look great, it displays one of the most popular quotes from the book, Effie Trinket's quote, "May the odds be ever in your favor." The center of the design features an image of Katniss taking aim with her bow. Wear this design as you chant, "Down with the Capitol!" This Hunger Games tee supports the resistance. In addition to the Odds in Your Favor tee above, browse the Hunger Games Clothing Gallery for more apparel like men's and women's clothes, kids shirts or hoodies.